To understand the term lumbosacral spondylosis without myelopathy, we have to learn individual term first. Spondylosis is a condition in which the vertebrae show degenerative changes due to old age. The word spondyl was anciently used for vertebrae. Lumbosacral is the part of vertebrae involving both lumber and sacral region. Myelopathy is a condition which describes injury in spinal cord due to compression. So degenerative changes in lumbosacral region of vertebrae due to aging is known as lumbosacral spondylosis. Myelopathy is not the reason behind spinal changes. The triads of joints present in spinal column are affected due to osteoarthritic changes. The joints mainly involved are paired zygapophysial joints posteriorly and the disks present in between vertebrae anteriorly. With the passage of age, these degenerative changes are ubiquitous but sometimes lower back pain is associated with it. Patients with old age are at more risk of lumbosacral spondylosis. It can occur around the age 65. Patients with lower back pain are have 7 to 75 percent chances of spondylosis. Age is the biggest risk factor other factors affecting lumbosacral spondylosis involve genetic predisposition, joint overload, previous trauma or injury and being a women is another risk factor. The main symptom related to lumbosacral spondylosis is lower back pain. If zygapophysial joint is affected, then patient may feel tenderness in paraspinal region. 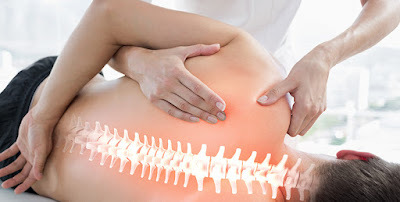 Patient may continuously suffer moderate pain in lower back region but sometimes it becomes severe and unbearable. The hips and sacroiliac joint function properly. It is considered asymptomatic because it does not show any other symptoms than pain. If nerve compression occurs, then pain may radiate to neck and shoulder. Nerve compression can also cause headache. Muscle spasm and trigger points with severe or chronic pain are also reported symptoms. Aging is the biggest cause and risk factor of lumbosacral spondylosis. Ligament and bone spurs occur as a result of osteoarthritis. The discs present in between the vertebrae start to degenerate and weaken. Weaken discs may lead to bulging and herniation. The increased rate of occurrence of lumbosacral spondylosis is partially dependant on genetic predisposition and previous injury. Genetics is another leading cause. If anyone in guardians suffered from spondylosis, then most probably it can occur in their siblings. Osteoarthritis and previous injury are also included in risk factors and these can make the previously present condition worse. The changes in lumbosacral region once occur, it cannot be reversed. So treatment strategies are designed to relief symptoms. Patient have to adopt some life style changes. Improving life style will help a lot in eliminating symptoms. Patient is asked to do exercise specially yoga. As yoga is beneficial for health. NSAIDS are prescribed to relief pain. Along with medication therapy, patient should go for physical therapy. If medications do not work, then pain relieving injections are the 2nd option. Surgery is not commonly recommended but it can only be performed to stabilize the vertebrae.